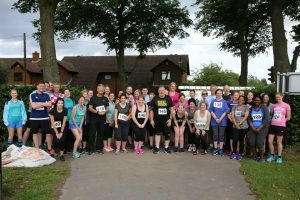 The Bournville Harriers Beginners’ Course starts on 10th May, this 6-week course will suit people that have very little or no running experience but would like to give it a try in a friendly, safe and supportive outdoor environment. The sessions will be held on Monday and Thursday evenings, with registration at 7:15pm. The course finishes with a 5km race on 21st June. The cost of the course is £20 which can be redeemed against full membership of the club within the first year. Lots of our members are graduates of the Beginners’ Course, read some of their stories here. Club members are asked to help to publicise the course by sharing links to the Facebook page, the details on the club website, or simply telling your friends and family about the course. As a thank you for promoting the course, we’ll put your name (members only) in a prize draw to win a £20 BvH kit voucher if you successfully ‘refer a friend’ (just ask them to give your name when they complete the registration form, which is sent after payment is received). Click here to go straight to registration. This entry was posted in Announcements, Beginners, Beginners Course by BvH Admin. Bookmark the permalink.